27/06/2017 Borgeby Fältdagar 2017 opens tomorrow. It is time for the agricultural event of the year in the field! The meeting place for the entire sector. The show for all those who have farming as their main interest and occupation, attracted by a winning combination of demonstration crops and machinery in action. A record number of more than 400 exhibitors are now ready to receive visitors during the two days of the show. 30/09/2016 Smart tillage at Borgeby Fältdagar 2017. The theme for next year’s Borgeby Fältdagar will centre on soil tillage and crop establishment based specifically on the conditions on each individual farm, an approach we call smart tillage. 08/07/2016 Potatoes in focus once again in 2019. 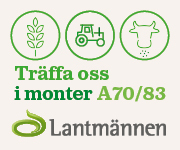 It was a very successful venture with a special theme for the professional potato grower at Borgeby Fältdagar this year. Therefore, the organizer has already decided to have the theme once more. Potatoes will be back at the fair in 2019. 30/06/2016 Double record during Borgeby Fältdagar. Borgeby Fältdagar was once again a record-breaker during this year’s event on 29-30 June. 22 100 visitors came to Borgeby over the two days of the show. This is an archive of previous press releases. Click on the respective press release to view it in full. They are arranged in chronological order, with the most recent listed first.